I wake up every day to find the street displaying the polarization in the country. I see all the walls covered by pro Muslim Brotherhood words or by words inciting nationalism and supporting the army and President Sisi. I walk by the massive amount of military tanks and soldiers with heavy guns, covering their faces. We suffered a lot in the past four years, but the country is minimized to consist only of the army and the police. Although I really sympathize with the deceased army and police personnel killed by the terrorists, I ask: Who cares for the freedoms and basic life needs of ordinary Egyptians? I see Egypt fighting three main problems: ultra nationalism, fundamentalism, and militarization. The ultra nationalism as a product of the state, it leaves no option for the citizen to choose and express his or her political affiliation and it uses the citizens as donors, for example asking them to buy shares in the project of re-establishing the Suez Canal. This ultra nationalism is in coordination with militarization; nowadays the army produces many goods, almost monopolizing some sectors of the economy, like construction. What I really hate about militarization is that the military junta decides what our battles are and how and when to start them, while some others’ battles are totally neglected. If you do not follow the dictated check list, it is easy to be named a traitor or not a "good citizen" or be jailed under the state’s concept of "with us or with terrorism". It is easy now to be jailed for exercising basic human rights like the right of expression or right of assembly. The junta was supported by the judiciary and other legal minds to make laws to hinder freedom and liberties. This was obvious in the establishment of the "legal reform committee" which overrode the rule of the parliament. Furthermore, two of its members are from the Muslim religious institution Al Azhar. One of the legal tools used to suppress freedom is the protest law. Enacted in the interim phase, between the 3rd of July toppling of Mohamed Morsi, and the election of a new president and drafting of the constitution. The protest law ends any chance for the Egyptian people to take to the streets again, in the event that the ruler becomes a dictator. It is noteworthy that popular mobilization and protesting is the only weapon of Egyptians in front of any tyrant. The military was accepting and encouraging of people’s protests against Morsi. 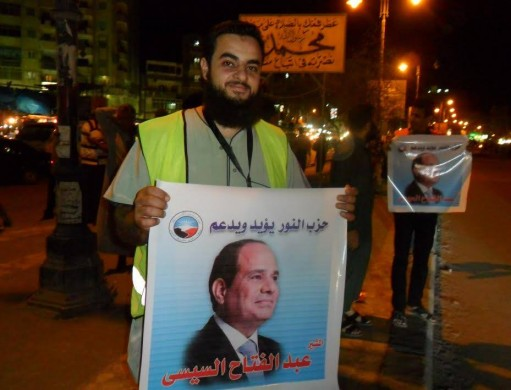 Then, after Sisi’s presidential campaign began, this law was enacted. The military regimes used thugs in the protest of 21st of June and has now made protest illegal. Militarization is controlling the public sphere and the first victims are women. It is easy for me as a human rights defender to write about cases of violations, but when I write about my dearest friend and coworker Yara Sallam the problem becomes much more personal. Yara was awarded the North African Human Rights Defender Shield and she has been involved in Human Rights activism since her university years. I worked with Yara and I quote her: “we need reforms, not tear gas". She is imprisoned for more that 100 days, since the end of June 2014. Yara is a symbol of the victims of the military regime’s attack on liberties. Meanwhile, the fundamentalists play their role by defaming all Human Rights Defenders by saying that they are agents to the west and funded by the enemies of the nation. The street is invaded by oppressive forces, while those who seek justice and freedom are struggling. To support Yara and her fellow prisoners, please share this article, along with the statement for their release.